At Headquarters, we commemorated the month with our annual Women’s History Month Event. Dr. Marjorie Spruill, Professor Emerita at the University of South Carolina, delivered a thought provoking talk on her new book, Divided We Stand: The Battle Over Women’s Rights and Family Values That Polarized American Politics. In Divided We Stand, Spruill delicately details the events leading up to 1977’s National Women’s Conference, inclusive of actions taken by feminist leaders and those who opposed the women’s liberation movement, such as Phyllis Schlafly and her Eagle Forum. Dr. Spruill’s talk highlighted women on both sides of the aisle who overcame preconceived notions of a woman’s place in society to reshape the course of American history. The General Federation of Women’s Clubs was formed to carve out a space for women that hadn’t previously existed. In that sense, GFWC has been persisting and reshaping history for 127 years. In this spring’s newsletter, we explore clubs who have worked to counter discrimination in their communities, helping to make the world a better place in the process. We hope that this newsletter inspires you and your club the way it has inspired us. Thank you for all that you do and for making history! In their battle for recognition as a state, and as full citizens, Arizona Clubwomen faced discrimination at every turn. Although Arizona officially became a United States Territory in 1863, it wouldn’t achieve statehood until February 14, 1912. Arizona clubwomen believed statehood and suffrage were inextricably linked, and that both were integral matters in the push to enter the Union. At the turn of the century, members of Congress believed residents of the Arizona and New Mexico Territories were “too un-American and uneducated to merit statehood.” Feelings about the territories’ unsuitability for statehood led lawmakers to debate if the two territories should be admitted as one large state, known as jointure. Arizona suffrage leaders and clubwomen Josephine Hughes, Frances Munds, Pauline O’Neil, and Sharlot Hall adamantly opposed the idea. For a decade, Arizona suffragists joined in public relations efforts with territorial politicians to improve Arizona’s image and encouraged legislation that would show Arizona as a civilized territory worthy of statehood. Clubwoman Hall wrote a 64-page article in Out West, a publication which prided itself on being the “magazine of the old pacific,” devoted to changing the negative image of Arizona’s frontier. Hall also penned the poem “Arizona” which was distributed to each member of Congress and reprinted in the Congressional Record in 1906. Her writings proved to be instrumental in changing Congress’s perspective on the territory of Arizona. In their push for statehood, suffragists also demanded the Arizona Constitution include voting rights for women. Unfortunately, while the Arizona Suffragists helped to pave the way for statehood, the members of the Constitutional Convention felt President Taft and Congress would reject adding women’s voting rights to the Arizona constitution. Therefore, Arizona’s first constitution was adopted without a provision for women’s enfranchisement. Following Arizona’s confirmation into the Union, Hall and others continued their campaign for women’s suffrage. She continued to publish articles highlighting the contributions of the Arizona Federation of Women’s Clubs and other women’s organizations to their communities. A mere eight months after Arizona achieved statehood, women’s right to vote was amended to the Arizona Constitution. Women who serve are often overlooked in the public narrative surrounding veterans. Almost two decades ago, GFWC Crystal River Woman’s Club recognized this issue and worked to change it. In 1999, Crystal River clubwomen began the annual tradition of hosting their Lady Veteran Appreciation Luncheon to ensure women veterans in their community were recognized and appreciated. The Crystal River clubwomen obtained the names and addresses of women from all backgrounds and all parts of their community who had served in the armed forces. The luncheon is held each November, close to Veterans Day. Typically, there are around 40 veterans in attendance. Women veterans in uniform represent every era from World War II to Desert Storm. Hosted at the Crystal Woman’s Club clubhouse, patriotic decorations and entertainment are enjoyed by all. A color guard from a local high school R.O.T.C presents the flag and sings the Star-Spangled Banner; a representative of the Armed Forces speaks to the women each year. The Crystal River Woman’s Club is extremely proud to have the honor of hosting this lunch and the ability to grant their community’s women veterans the appreciation and recognition they deserve. In 1914, 25 women joined together to form the Auburndale Woman’s Club. Almost immediately, they agreed their primary civic duty was to advocate for the children of their community who could not advocate for themselves. Since their founding, the Auburndale Woman’s Club have facilitated the construction of a new school and established a town library, among countless other community projects. More than a century later, the clubwomen of Auburndale continue to give a voice to the children of their community. Currently, the GFWC Auburndale Woman’s Club donates both time and funds to support the Anchor House for boys and the Hacienda Girls Ranch for girls. The two facilities provide unconditional support for abused, abandoned, and neglected children. Anchor House offers a traditional group home on a campus for boys, 10-17, and transitional housing to young men, 18-21, who have aged out of the foster care system. They help develop life plans for the boys by goal setting, education, counseling, and practical experience. Their goal is to prepare them for reunion with family or help them live an independent life of self-sufficiency. The Hacienda Girl’s Ranch in Melbourne was established in 1968 as a shelter for homeless girls. Its goal is to provide each girl with new beginnings, new opportunities, and new hope. Hacienda believes that every girl should have an equal opportunity for healthy emotional and physical growth. It offers mental health counseling, remedial education, and vocational opportunities. Some girls take part in an Independent Living Program to prepare them to live on their own. The Florida Federation of Women’s Club, with the help of local clubs, proudly funded the construction of three buildings on the campus. Hacienda continues to be funded by the Florida Federation of Women’s Club, public donations, and foster care payments from the Florida Department of Children and Families. For many years the Auburndale Club has taken an active role with both the Anchor House and the Hacienda Girls Ranch. 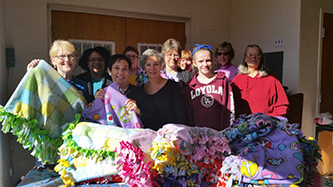 The clubwomen of Auburndale are proud to continue their support of the children of their community. In May 2014, the Women’s Club of Farmingdale (WCF), under the direction of its Resolutions Chairperson Frances Rotondo, prepared a resolution in support of Bill S. 1752 (The Military Justice Improvement Act). The bill pertained to sexual harassment in the military of men and women. This Resolution was brought to the attention of the clubs by the GFWC New York State Federation of Women’s Clubs. It encouraged all women’s clubs of New York State to stand behind the Military Justice Improvement Act and to lobby government officials to seek approval for the benefit of our military personnel. This Bill calls for independent, trained, professional, military prosecutors to rule on any crime punishable by one year or more in confinement. The WCF Resolution Committee researched newspaper articles, the Library of Congress, and the New York State General Federation. After membership completed and approved the Resolution, they presented it to the Long Island Federation for approval. Because a Bill already had been introduced in Congress, the federation decided support would be better voiced through a petition. The petition was read at the Long Island Federation Tri-County Conference, and members from Long Island and Queens were encouraged sign. The petitions were collected and sent to the appropriate government officials. Sadly, the Military Justice Improvement Act fell five votes short of approval. It was our hope this petition would encourage passage as part of the National Defense Act already in place. However, the Women’s Club of Farmingdale and the Long Island Federation still stands with members of the military who have experienced harassment and they continue to work fight discrimination. The Women’s History and Resource Center is excited to announce that it will now be opening up its quarterly newsletter to all clubwomen. The WHRC newsletter provides an in-depth look at the celebrated history of GFWC on the national, local, and individual levels. A publication primarily written by clubwomen, the newsletter proudly publishes articles written by you and about your history. The WHRC newsletter is also the best way to stay up-to-date on the latest events and happenings in the Women’s History and Resource Center. To sign up, please visit www.gfwc.org. An enrollment box is located at the bottom on the website, underneath the News & Notes sign up. You can also sign up by providing your name, mailing address, email, and club name to GFWC Membership Services Manager Kate Garlick at kgarlick@gfwc.org.